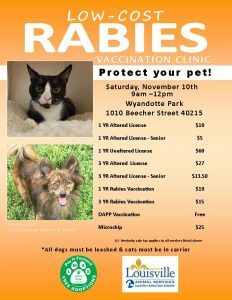 “A pet license is assurance your pet’s Rabies vaccination is up-to-date, so if they become lost they won’t receive the vaccine unecesssarily if they were to enter the shelter,” said Barnes. “Another benefit is if your pet is lost and picked up by an animal control officer, we can bring them home instead of to the shelter. Your pet won’t be exposed to germs and illnesses commonly found in animal shelters.